Do Dogs Need Vitamin C Supplements? Since dogs can produce vitamin C in their bodies, many dog parents wonder if they need to give their dogs vitamin C tablets. True, dogs can make vit C in their bodies, but if a dog is stressed or sick, their bodies' output of vitamin C can quickly be depleted. In fact, it has been found that stress, both physical (e.g. fever, infections, etc.) and emotional (e.g. stress caused by a change in the environment), is the best-known cause of vitamin C depletion in dogs. 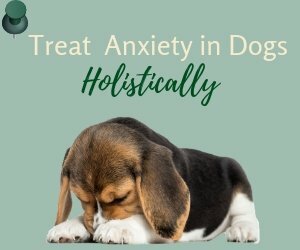 In addition, it has been found that dogs supplemented with vitamin C have stronger immune systems and show greater resistance to disease, and a better ability to recover from illness or injuries. Antioxidant: Vitamin C is an antioxidant. It works with vitamin E and helps regenerate vitamin E, enhancing its antioxidative effect. Immune Booster: Vitamin C improves immune function by enhancing white blood cell function and activity. It also increases the blood levels of interferon (the body's natural antiviral and anti-cancer compound) and antibodies (proteins that destroy foreign material such as bacteria, viruses, and toxins). In fact, many veterinarians (both conventional and holistic) now routinely include vitamin C in their treatment protocols for various illnesses. Some such illnesses include cancer, infections such as bladder and urinary tract infections (UTIs), respiratory infections (e.g. kennel cough), and others. Some veterinarians also suggest giving dogs vitamin C as a preventative and immune booster. For example, vitamin C can be given to dogs before and after vaccination, to weak and old dogs, to pregnant and lactating dogs, and to those that have been exposed to contagious diseases. Antihistamine: Vitamin C may also help with allergies in dogs because it functions like a natural antihistamine. If you want to supplement your dog with vitamin C, the best form is the salt forms of vitamin C, known as mineral ascorbates (calcium ascorbate and sodium ascorbate). Ascorbates are easily absorbed anywhere in the dog's intestinal tract. They are also considered to be the most gentle (buffered) forms of vitamin C and cause fewer side effects such as diarrhea or heartburn. Calcium ascorbate is pH-neutral, and has a slightly bitter taste. It is widely considered to be able to give the best results in relieving symptoms of arthritis. Sodium ascorbate is also pH-neutral. It has a slightly saline taste. 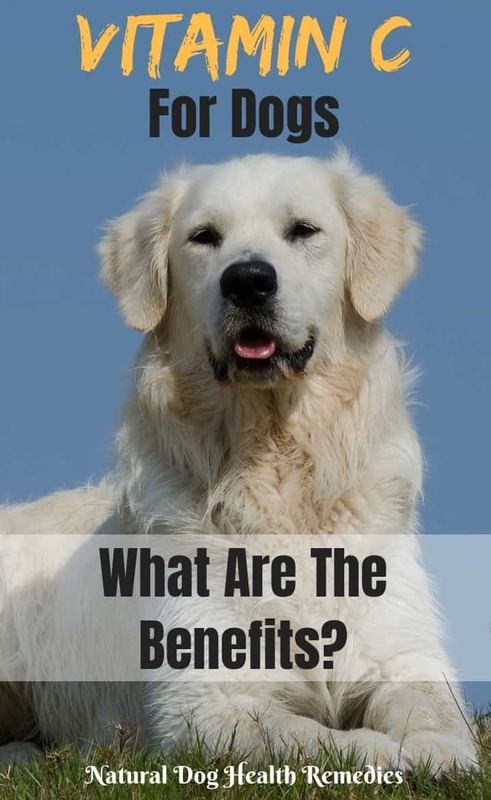 According to Dr. Wendell Belfield (the leading advocate of using vitamin C supplements in dogs), sodium ascorbate is the most effective form of vitamin C for dogs. 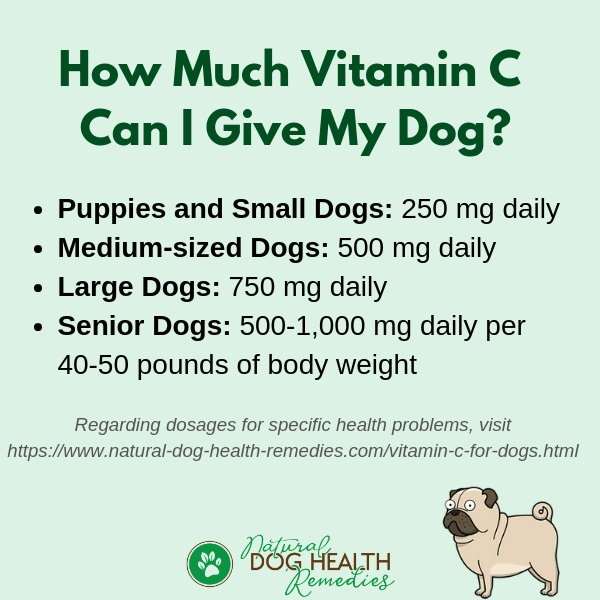 How Much Vitamin C Can You Give Your Dog? Since vitamin C is water soluble, you cannot actually overdose a dog with vitamin C because excessive amount is excreted through the kidney. However, too much vitamin C will cause diarrhea in dogs, especially if given in one dose. 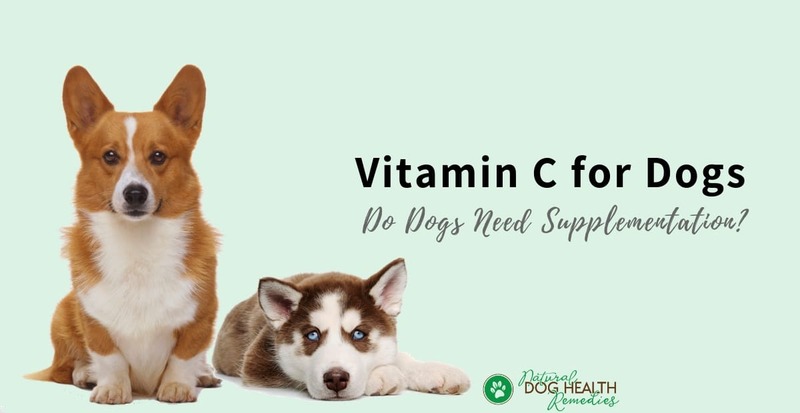 How much vitamin C to give depends on the individual dog's lifestyle and health condition, as well as the dog's tolerance level of vitamin C (i.e. the upper limit of vitamin C before the dog develops diarrhea). Arthritis: as high a dose as possible with diarrhea being the limiting factor, up to 5,000 mg/day. Update: A recent study has shown that high doses of vitamin C could actually speed up joint deterioration and pain in arthritic patients. So, I wouldn't use high doses of vitamin C as a dog arthritis treatment option. Ear Infections: 125 mg twice daily for small dogs; 250-500 mg twice daily for medium dogs; 500-1,000 mg twice daily for large dogs. Teeth/Gum Diseases: 125 mg twice daily for small dogs; 250 mg twice daily for medium dogs; 1,000 mg twice daily for large dogs. Upper Respiratory Problems: 125-500 mg twice daily for small dogs; 250-1,500 mg twice daily for medium dogs; 500-1,500 mg twice daily for large dogs. Skin Allergies: 125 mg twice daily for small dogs; 250-1,500 mg twice daily for medium dogs; 500-1,500 mg twice daily for large dogs. Bladder and Urinary Tract Infections: 125 mg twice daily for small dogs; 250 mg twice daily for medium dogs; 500 mg twice daily for large dogs. As Immune Booster: 500 mg twice daily for small dogs; up to 1,500 mg twice daily for medium dogs and large dogs. Bioflavonoids are powerful phyto-compounds that, when taken together with vitamin C, can help with the uptake and absorption of the vitamin because they prevent the vitamin from being broken down in the body. In other words, bioflavonoids increase the efficacy of vitamin C.
Even by themselves, bioflavonoids can help strengthen capillary walls. 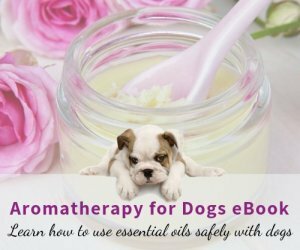 They are also beneficial to dogs with inflammatory conditions, such as IBD, and arthritis. So, if you want to get the most out of a vitamin C supplement, get one that has bioflavonoids in it. This vitamin C supplement contains rosehips and Indian gooseberry, both are rich sources of vitamin C as well as bioflavonoids. In addition to supplementation, you may also want to provide natural foods that are rich in vitamin C (and bioflavonoids) to your dog for added fortification. Foods that are high in vitamin C and bioflavonoids and palatable include such veggies as broccoli, kale, brussel sprouts, sweet red bell pepper, and spinach. Fruits such as pineapple, papaya, and strawberries can also provide your dog with good doses of vitamin C and bioflavonoids. You can use some such veggies and fruits as vitamin C dog treats! C. Schwartz, Four Paws, Five Directions: A Guide to Chinese Medicine for Cats and Dogs (Celestial Arts Publishing, 1996). 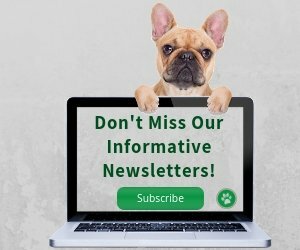 Glucosamine is good for arthritis in dogs!